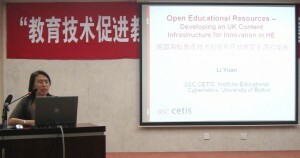 Two weeks ago, I joined my colleagues, Oleg Liber, Director of JISC CETIS and Sarah Holyfield, Communications Director of JISC CETIS to present at the 8th International Educational Technology Forum in Xuzhou, JiangSu province, China. 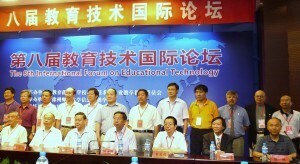 The conference is organised by the National Colleges and Universities of Educational Technology Direction Committe e and it provides a platform for experts and scholars in China and abroad to discuss the latest issues on the use of technology in education, and to learn from practice, exchange ideas and share mutual interests. 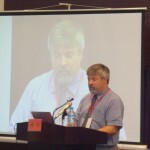 About 500 experts, researchers, teachers and students frome China, UK, US and Japan attended the conference. Professor Liber was invited to give a keynote lecture on “Cybernetics and Education: Insights from the Viable System Model” with a focus on Cybernetic Modelling as an approach to designing educational technology intervention. 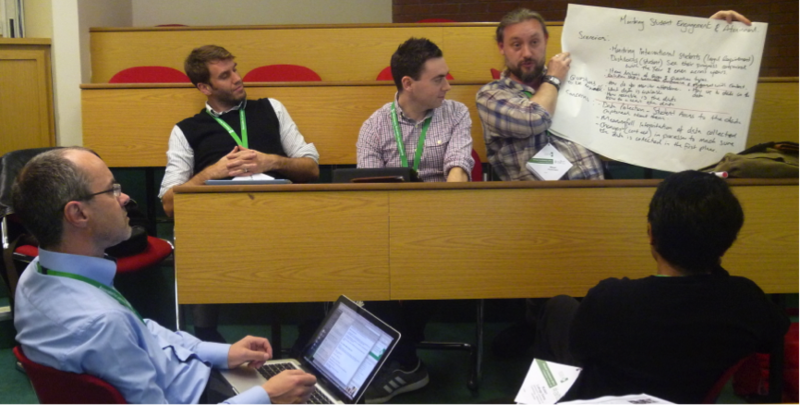 I gave a presentation on Open Educational Resources initiatives and the UK JISC-funded OER Programme at the conference. I also attended the Chinese Government Funded Educational Technology Programmes & Innovative Use of Technology in Education conference which was organised by the Higher Education Press in Beijing on 24th August. The speakers from different Chinese universities reported findings from their projects and research on use of technology to enhance teaching and learning. I was invited to give a presentation on the UK OER Programme and Innovation in HE and this provided an opportunity to discuss some mutually interesting issues with Chinese colleagues, such as copyright, interoperability and standards, etc. Not surprisingly, some other presentations at the conference also looked into models for sharing educational resources and the various barriers that prevent sharing and using teaching and learning resources, etc. After the conference, we visited East China Normal University, Shaanxi Normal University and Beijing Normal University, all of these a re universities which specialise in teacher training, and we ran seminars with staff and students from the Institute of Educational Technology in each of them. 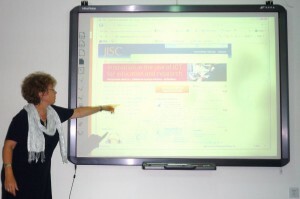 In these seminars, Sarah gave an overview of JISC and CETIS’s missions and aims, along with their programmes and activities to the audience of Chinese colleagues and students. Oleg talked about the major projects and development work that CETIS and the Institute for Educational Cybernetics (IEC) are working on, and the Inter-disciplinary, Inquiry–based learning programme (IDIBL)based at the IEC at Bolton; I t hen followed up with an input about the UK JISC-funded OER programme and the main challenges this is addressing. These seminars also initiated very interesting discussions with Chinese colleagues and students on various topics, and there is clearly a great deal of interest among colleagues in China in the whole question of Open Educational Resources and what these imply. It was very impressive to learn that universities in China have developed a comprehensive degree system for teaching, learning and research on education technology in order to service the needs of using technology to extend access to education and improve the quality of teaching and learning in China. In the field, there are 224 universities with bachelor degree programmes, 83 universities offer master level programmes and 8 universities are qualified for PhD programme, whilst 6 universities provide research fellowships. It is clear that the rapid development of education technology as a subject in Chinese universities also poses big challenges on curriculum design and student recruitment. For example, how to keep up with changing technology; how to meet students’ expectations and the needs of the job market in the field. During the visit, we discussed a wide range of issues with the Chinese colleagues, learnt from different perspectives, shared mutual research interests, and explored opportunities for developing collaborative research projects and partnerships. Sarah and I will write more about our visit to China and what we have learned. 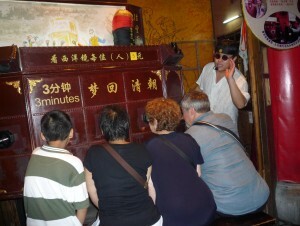 Finally and most interestingly, we found a street storyteller using an old fashion technology –“Magic Lantern” to present Chinese history stories which attracted many people (different age, gender and culture) who came to visit the modern Shanghai.